Researchers demonstrate how one payment card can transfer funds to another card by reflecting energy from ambient RF signals acting as both power source and communication medium. University of Washington engineers have created a new “ambient backscatter” wireless communication scheme that allows two devices to communicate with each other by reflecting ambient TV and cellular transmissions — batteries not required. 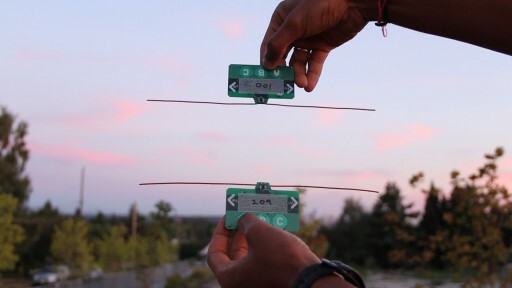 The researchers built small, battery-free devices with antennas that can detect, harness and reflect one of the ambient radio-frequency (RF) signals, which then is picked up by other similar devices. “Recent work has shown that one can harvest tens to hundreds of microwatts from these signals,” the researchers note in their ACM SIGCOMM paper. The technology could enable a network of devices and sensors embedded in objects and environments (“the Internet of things”) to communicate with no power source or human attention needed. “It’s hopefully going to have applications in a number of areas including wearable computing, smart homes, and self-sustaining sensor networks,” said lead researcher Shyam Gollakota, a UW assistant professor of computer science and engineering. Ambient backscatter: communication between two battery-free devices. 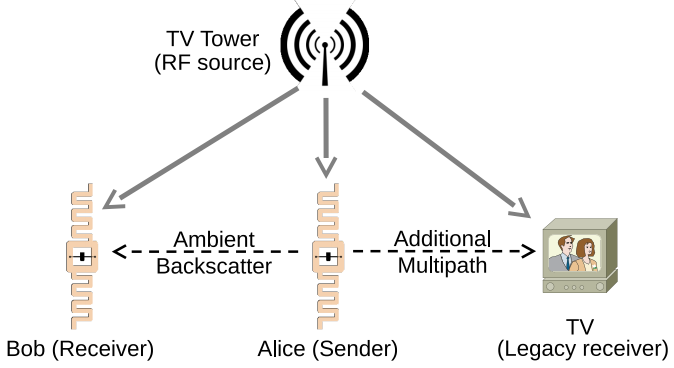 One such device, Alice, can backscatter ambient signals that can be decoded by Bob and other ambient backscatter devices. To legacy receivers, this signal is simply an additional source of multipath, and they can still decode the original transmission. Communication between two battery-free devices. One such device, Alice, can backscatter ambient signals that can be decoded by other ambient backscatter devices. To legacy receivers, this signal is simply an additional source of multi-path, and they can still decode the original transmission. “Our devices form a network out of thin air,” said co-author Joshua Smith, a UW associate professor of computer science and engineering and of electrical engineering. Smart sensors could be built and placed permanently inside nearly any structure, then set to communicate with each other. The technology can also be used for communication — text messages and emails, for example — in mobile and wearable devices, without requiring battery consumption. Credit-card-sized prototype includes a power harvester for TV signals and broadband ambient-backscatter hardware tuned to UHF TV signals from 515–565 MHz (channels 21 to 29 in the U.S.). The researchers tested the ambient backscatter technique with credit card-sized prototype devices placed within several feet of each other. For each device, the researchers built antennas into ordinary circuit boards that flash an LED light when receiving a communication signal from another device. Groups of the devices were tested in a variety of settings in the Seattle area, including inside an apartment building, on a street corner and on the top level of a parking garage. These locations ranged from less than half a mile away from a TV tower to about 6.5 miles away. They experimented with two proof-of-concept applications: a bus pass that can also transfer money to other cards anywhere, at any time and a grocery-store application, where an item tag can tell when an item is placed in a wrong shelf. The researchers published their results at the Association for Computing Machinery’s Special Interest Group on Data Communication 2013 conference in Hong Kong, which began Aug. 13. They received the conference’s best-paper award for their research. The research was funded by the University of Washington through a Google Faculty Research Award and by the National Science Foundation’s Research Center for Sensorimotor Neural Engineering at the UW. * Not a literal Morse-code system. 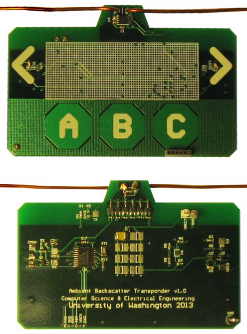 A transistor on the card toggles between backscatter (reﬂective) and non-backscatter (absorptive) states to convey bits to the receiver card.